Vietnamese trains are of two major types - Northbound trains (that travel from Ho Chi Minh City to Hanoi) and Southbound trains (that travel from Hanoi to Ho Chi Minh city). These trains maybe slow trains (code for these is TN) or Fast trains (code for this is SE). Trains usually start from Ho Chi Minh or Hanoi in the evening or the morning hours. There are generally no trains that start in the afternoon. Livitrans, Violette tourist services and Golden rains are some private Vietnamese rail companies that have certain coaches reserved. These coaches have the same berths as the other seats on the train, but the facilities and services on these private tour operators are better than on the government-run coaches. While the fares are proportionately higher, they offer a comfortable option for those looking to travel Vietnam by train. Booking a train ticket in Vietnam is very easy. You can book it in three ways - online, through a travel agency or at the railway station. If you are not particular about class and coach, you can book tickets at the station. But it is advisable to pre-book tickets during peak season or festival season (For example, trains fill up fastest during Tet season). Bookings open up around 60-90 days prior for long distances. For shorter distances train tickets open up later, opening up just a few days prior for jump stops. 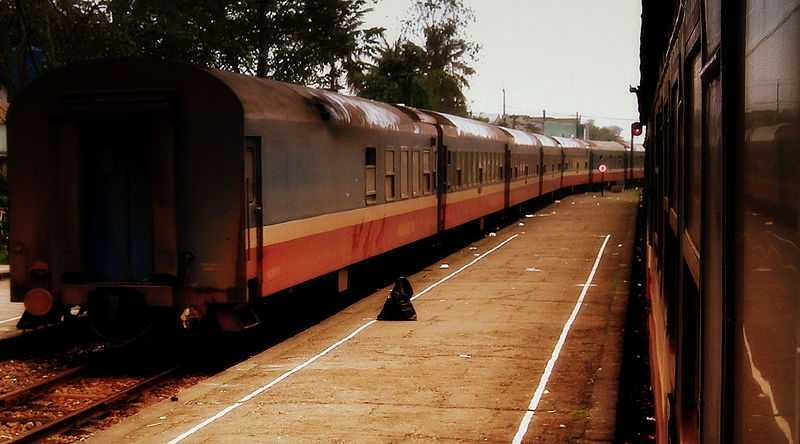 You can book train tickets online through websites like 12Go.Asia (Train ticket + 60,000 VND service charge + 4% for online credit card transaction) or www.baoloau.com (Train ticket + 40,000VND service charge + 2.7% for online credit card transaction). Train tickets can be booked only after the ticket bookings open up, so if the portal doesn't allow you to book tickets, it might be too early to book tickets. The platform allows you to select your seats from a graphics display on the screen, making it one of the easiest ways to plan your train travel in Vietnam. The ticket is emailed to you, which you can choose to print or keep on your smartphone to show while boarding the train. Credit cards of all countries are accepted. You can also book tickets through the official Vietnamese railway's website, but it doesn't accept non-Vietnamese credit cards. Another reliable way of booking tickets is through a travel agency. They will book your train tickets and mail it to you. They charge a handling fee for booking tickets for you, but it is a guaranteed way of booking tickets. Book tickets in advance so they have enough time to mail the tickets to you. Trains are busy, but when you go to the station you will get some train. It is not a bad idea to book tickets if you are flexible with trains and timings. However, it is advisable to look up trains and tickets on www.dsvn.vn, the official Vietnamese railway booking site. You can also reserve online and pay and collect your tickets at the station, within 24 hours. Numerous hawkers move along the Vietnamese trains, pushing trolleys filled with food. However, food on these trolleys is overpriced and often there is a poor selection menu. Also, the frequency of trolleys is erratic and unpredictable. There are cases where train food has made people sick and it is definitely not for the weak-stomached. It is advisable to carry pre-packed food during your train travel in Vietnam to avoid unnecessary illness. If you are adventurous enough, go for it! There are no specific allotted smoking zones in trains in Vietnam, but generally, you can smoke in the passage between two coaches, behind a door. However, sometimes the conductors do not allow smoking on the train. 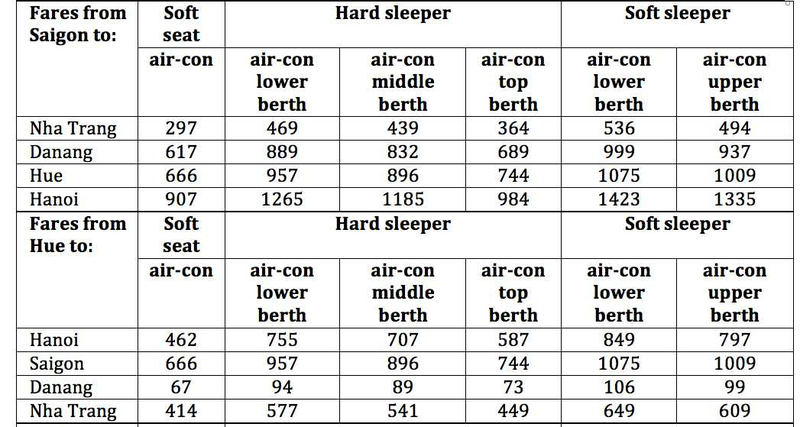 (air-conditioned) A soft sleeper has different cabins. Each cabin has four beds - two on the top and two in the bottom. Each bed has a light and a charging port. Pillows and linen sheets are provided. Each cabin has a small coffee table in the middle. The cabins can be locked from inside. (air-conditioned) A hard sleeper also has different cabins. Each cabin has six beds - two upper berths, two middle berths and two lower berths. Each bed has a light and a charging port. Pillows and linen sheets are provided. Each cabin has a small coffee table in the middle. The cabins can be locked from inside. (air-conditioned) These are soft comfortable seats that have cushions. They can be reclined. These seats also have power sockets. (air-conditioned) These are hard wooden seats, with no cushions. It is a bit hard on the rear for long journeys but suitable for short journeys. (not air-conditioned) These are hard wooden seats with no cushions and no air conditioners. On the plus side, these windows can be opened, which makes it ideal for photographing the surroundings. General Hygiene is poor. You are provided with a pillow and a thin linen sheet in sleeper cabins and these maybe dirty or unwashed. The toilets are manageable but aren't very hygienic. There are two restrooms in each car, one is a squat toilet and the other is a western toilet, both of which aren't very clean. If you need paper to wipe, you must carry your own. Vietnamese trains are fairly safe, but there have been numerous incidents of petty theft and it is safer to keep your valuables on you. Also, strapping your bags onto yourself is an extra measure of safety. It is safe for solo women travelling. Sleeper cabins have an edge over seats in the fact that each cabin has a lock. Generally, Vietnamese trains are not very punctual and there is a delay of at least 20-30 minutes. Train timeliness is affected a lot by the weather. If it rains trains may get delayed more, up to an hour and a half too. Train fares are quite inexpensive and this makes travelling Vietnam by train the best mode of transport for those who are on a tight budget. Children below the age of 4 travel free. For children from 5 - 9 years travel at 25% off in sleepers and 50% off in seats. The fare given below is the approximate fare of the SE (fast) trains. The prices for TN trains are lesser and all the prices are subject to seasonal variation. All prices shown are in terms of 1000's of VND. There are three border crossings from Vietnam to China: Lao Cai in the north and Mong Cai and Dong Dang in the east. You can easily reach Nanning, Guilin, Beijing, Hong Kong, Kunming and even Shanghai by train. There are overnight sleeper trains that travel from Hanoi to Nanning, Guiling and Beijing every day while a soft-sleeper train travels twice a week. The approximate distance between Beijing and Hanoi is almost 3,000 kms with tickets costing around VND 68,00,000 while Nanning to Hanoi is almost 400 kms with tickets for around VND 750,000. From Nanning, you can continue to Shanghai on a high-speed train that will take you 12 hours or a fast train that will take 24 hours. To reach Hong Kong, you can take a train from Hanoi to Nanning or Guangzhou. This trip will cost anywhere between VND 17,00,000 to VND 25,00,000. Depending on your time restrictions, you can take a sleeper train that will take 2 nights and 1 day (to be spent in Nanning) or you can take a high-speed train which will only take one night with a quick transfer in Nanning. To travel to Kunming, you can travel from Hanoi to Lao Cai on an overnight sleeper. Lao Cai is just 2.5kms from the Chinese border, from where you can travel to Hekou. From Hekou, you will find plenty of trains travelling to Kunming. For all these travels out of Vietnam into China, don't forget that you will require a Chinese visa on entry. This can be either a transit visa or a tourist visa. Requirements for both these visas vary between nationalities. Most often than not, you will require a ticket proof in order to obtain a Chinese visa. With this in mind, be sure to book your tickets and make travel plans accordingly! Travelling Vietnam by train is not for the faint-hearted. It is comfortable and inexpensive but the facilities, cleanliness and on-train food are not too great. However, it gives you a peek into Vietnamese local life. Train travel in Vietnam leaves you with stories to tell and lets you experience the true essence of the country. So if you are adventurous enough, train travel is for you!